Modern design. Contemporary looks, brushed metal and two sizes to choose from. Resilient. Weatherproof aluminium construction makes a strong yet lightweight board, making it easy to bring it inside after each day's trading. Locking mechanism. Instead of flimsy magnetic attachments, the four edges of each display panel clip open and shut to hold your poster and the anti-glare plastic covering firmly in place. If you supply your own artwork, please deduct £30.00 from the prices shown above for the first board. Additional boards are the same price as shown above. If you supply your own artwork, please deduct £30.00 from the prices shown above. We give staged discounts for multiple pairs of prints ordered at the same time, so if you have two or more boards which need replacement posters, please contact us for an instant, all-inclusive price. Please note that if you provide a file at less than 100% of size, some slight pixellation of the finished print may be noticeable, but since A boards are viewed from a distance, this effect will not be problematic. More about image resolution and pixellation. A boards and posters are despatched within 5 working days. 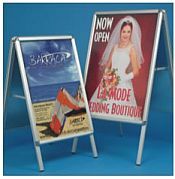 A boards and replacement posters are standard rated for VAT. Unfortunately it is not practical for us to supply samples of A boards or posters. If you have any questions about either the boards or the posters, please feel free to contact us using our Design Advice Line on 01457 778788 and we will be delighted to help.